Every year, we acknowledge the outstanding contributions of physicians around our province through the Doctors of BC Awards. This year, the ceremony took place at our Annual General Meeting event in Vancouver June 2nd. Doctors of BC congratulates all the recipients who have made and continue to make a meaningful difference for our patients, for the profession and for health care system. To view all photos from the AGM, Awards Banquet and President’s Dinner click here. The Dr Don Rix award recognizes lifetime achievements and exemplary physician leadership so outstanding that it serves as an inspiration and a challenge to the medical profession in British Columbia. Dr Julio Montaner has dedicated his career to improving the care and treatment of people with HIV/AIDS to become one of the world’s top AIDS researchers. Dr Montaner’s single biggest contribution came when he pioneered the anti-retroviral therapy HAART – or triple drug therapy – which has become the international standard of care for patients living with HIV/AIDS. He also founded the United Nations Program on HIV/AIDS known as 90-90-90, which has become the world standard for prevention and treatment, and is credited with saving millions of lives around the world. In recognition of his contributions, Dr Montaner has been inducted into the Order of British Columbia, the Order of Canada, the Canadian Medical Hall of Fame and was recently awarded the Killam Prize which recognizes the careers of Canadian researchers and scientists who have had an impact on Canadians and the world. The Dr David M Bachop Gold Award is given to a BC doctor who has made an extraordinary contribution in the field of organized medicine and/or community service. Dr Marshal Dahl focused on a career as an Endocrinologist because “there are a number of people out there with treatable and curable conditions.” During his many years as a physician, Dr Dahl has held numerous leadership roles locally, provincially and nationally including President of Doctors of BC, President of the Endocrinology and Metabolism Society of BC, Chair of the Canadian Medical Association Council of Health Policy & Economics, and most recently Division Head of UBC’s Division of Endocrinology and Metabolism. 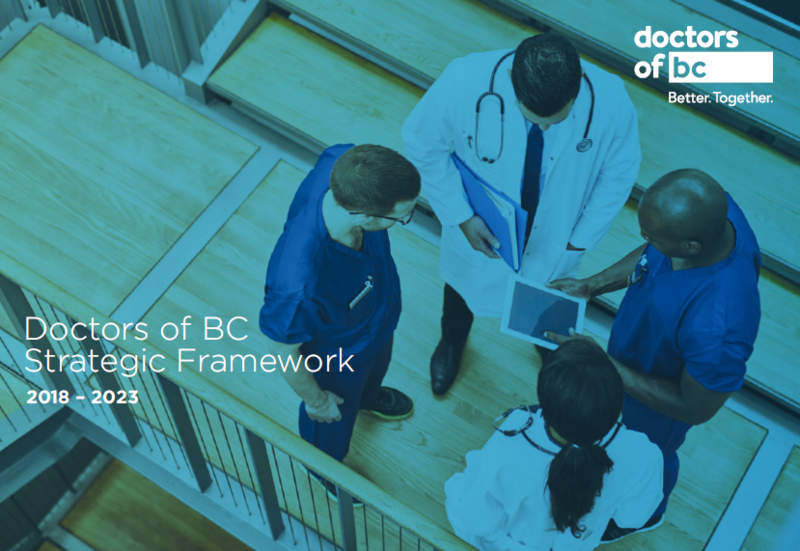 In collaboration with a number of key stakeholders, Dr Dahl undertook the first BC wide, comprehensive diabetes needs assessment – the results of which are expected to play a big role in redesigning diabetes care in BC. Three physicians are recipients of the Doctors of BC Silver Medal of Service, which goes to those who made outstanding contributions to medicine and/or improving the welfare of British Columbians. Dr Jill Calder is a champion of quality health care in her community. She is the primary physician for ALS patients, actively managing the bulk of their care including complex end-of-life care. Through her work with Autism Community Training, Dr Calder created a local autism society which helps inform parents and professionals about evidence-informed approaches to early intervention for children with autism. She has also been an advocate in influencing autism policy at the provincial level. Furthermore, Dr Calder has created physician recruitment committees to address specialist shortages and turned a declining medical school program into one that is thriving today. Dr Shelley Ross has made significant contributions to improving the health of British Columbians and to women’s health and the national and international level. Through her involvement with the Medical Women’s International Association she has advocated on behalf of women in medicine and women’s health globally. Dr Ross has also had a long involvement with Doctors of BC, holding such positions as President, Chair of the General Assembly, Chair of the Council on Health Economics and currently she is Co-Chair of the General Practice Services Committee. And for over 30 years, she maintained a family practice medicine with a significant emphasis in obstetrics – delivering close to 300 babies every year. Dr Mark Schonfeld practiced family medicine for 22 years, during which he served as Head of Family Practice at BC Children’s Hospital and as Medical Director of the Discharge Planning Unit at Vancouver General Hospital. He has a long and distinguished service to Doctors of BC which encompasses such roles as President, Director of Professional Relations, and CEO. During his career, Dr Schonfeld was instrumental in the establishment of EMR/IT programs for physicians and in the development of pilot projects for Chronic Disease management. The Dr David M Bachop Silver Medal is presented to the UBC Family Practice Resident who achieves the best overall result in the Family Practice Certification. Dr Erika Reiser is currently providing locum coverage in different settings, and will be focusing her attention on rural communities where she plans to set up a full service family practice. The Dr Cam Coady Award commemorates Dr Coady’s great love of medicine and ensures his goals and objectives to achieve excellence in health care continue to be fostered. Dr Paul Dubord has dedicated much of his professional career to helping people regain their sight. He has played a significant role in delivering ophthalmic services and mentorship around the world, including developing National Programs in Canada, the United States, Japan, and India. He is the founder and driving force behind Eyesight International, a non-profit organization dedicated to eliminating blindness and bringing self-sustaining eye care to people in developing countries. He has been actively involved with the World Health Organization in multiple roles and has received countless awards for his leadership. Ms Mia Harries and Ms Jena Kruckenberg, students at the University of the Fraser Valley, are recognized for creating the Resource Navigation Program which connects community members with local resources to support patient health and well-being. Calling it a “first-person approach to healthcare,” they believe that early community intervention in areas related to social determinants of health – such as economic, food and housing concerns – can help prevent future health related problems. Access RDSP (Registered Disability Savings Plan) is a province-wide initiative awarded for assisting individuals living with a disability – and their families – with access to available resources that help ensure financial security. It is comprised of three partner agencies – the British Columbia Aboriginal Network on Disability Society, the Disability Alliance BC, and the PLAN Institute – and provides a “one stop shop” for all things RDSP. Since 2016 it has supported more than 1,500 clients. Medimap, a Vancouver-based online platform which enables live communication between health care clinics, is recognized for helping patients easily navigate the primary care system to find same-day access to care. Since its 2015 launch, Medimap has partnered with 79% of walk-in clinics in BC, 400 clinics country-wide and has been accessed by more than one million people. The Changemaker Awards recognize medical residents and students who are demonstrating exemplary leadership through grassroots advocacy efforts. Ms Lerly Luo is a third year medical student in UBC’s Medical Program. She has been a student leader in global health advocacy provincially, nationally and internationally. Ms Luo was elected as Vice President of Global Health for the Medical Undergraduate Society (MUS), co-founded and co-hosted the Global Health Conference at UBC and has represented medical students to Members of the Legislative Assembly, Senators and Parliamentarians. Ms Luo was also selected as one of eight Medical Student Delegates at the 2016 and 2018 World Health Organization Executive Board Meeting, representing the voices of more than one million medical students worldwide on international health agendas. Dr Alicia Pawluk is a family practice resident in UBC’s Family Medicine Program, and was recently elected into the position of Chief Resident for the entire Family Practice Residency Program. In this role she represents all 350 family practice residents across BC, which is no doubt a testament to her leadership and advocacy skills. Through her work with the Resident Resiliency Subcommittee, the Victoria Wellness Committee, and the Integrative Medicine in Residency pilot project, Dr Pawluk has championed for the identification and creation of wellness and resilience resources for all residents. She has also advocated for significant changes to the Transition to Practice Curriculum, has made noted improvements to the College’s licensing process for new physicians, has been a strong voice for resident safety, and has been a contributor and co-organizer at multiple World Health Organization events.